When you wake up in the morning, do you experience pain in your jaw joint? Do you have difficulty opening or closing your mouth? Do you have sensitivity in your teeth or do they look shorter? Do you get routine headaches? These could be clear signs of grinding or bruxing. If un-controlled, you can damage your jaw joint, your teeth or any dental work you have received from your dentist. There is currently no cure for bruxing but it can be controlled. If you grind your teeth during the day or at night, your dentist will recommend a night guard to protect your teeth from these grinding forces. A night guard is a plastic cover that fits over your teeth to deflect the hard forces of chewing. Night guards will also increase the longevity of your dental work. During the first visit your dentist will take an impression of your teeth. 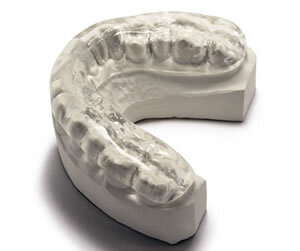 This impression is then sent to a dental laboratory where a custom-fit night guard is made. On your second visit your dentist will show you how to place it into your mouth and will adjust it to your bite. There are different kinds of night guards from soft materials to harder plastic materials. Your dentist will recommend you the material best suited for you. I’ve been seeing Dr Tee for 8 years. He provides top dental services to my teeth. He is always professional, polite and caring. Providing exceptional dental care for patients since 1986. We offer quality service at an affordable price. If searching for a dentist near Tempe, we are within 25 minutes of each of these municipalities. Mon - Tues and Thursdays 9-5:30pm .